A general meeting is a meeting of a company's shareholders (unlike a board meeting, which is a meeting of the directors). 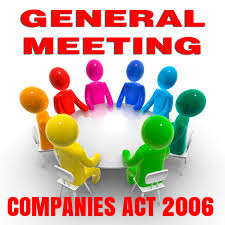 Companies Act 2006, Part 13 (comprising 80 sections) provides the statutory framework for the calling and conduct of general meetings. Note, too, that resolutions can also be passed as written resolutions (without having a general meeting) and there is now no statutory requirement for a private company to hold an Annual General Meeting, unless the articles make provision for one to be held. For any particular company, the statutory rules are supplemented by that company's articles. Many companies have the provisions of the Model Articles (articles drafted from 1.10.2009) or Table A (older companies), either completely or with some amendment. There are two types of general meetings: Annual General Meetings and Extraordinary General Meetings. There is no requirement for a private company to hold an AGM, though some companies' articles, drafted when there was a statutory requirement to hold an AGM, will still provide for one to be held. In such cases the company must continue to comply with its articles until they are amended. There is nothing to stop a company to hold an AGM even if it is not required to do so. The usual business of an AGM is to receive the annual accounts and directors' report and, in some companies to elect directors and/or auditors. Even if there is not going to be an AGM to discuss the accounts, they still have to be distributed to the shareholders. An Extraordinary General Meeting (EGM) is any meeting other than an Annual General Meeting (AGM). The directors may call general meetings when they wish (CA 2006, Sec 302) and must call a meeting of members holding one-tenth of the voting shares or one-tenth of the voting rights request one (Sec 303 - Sec304). If the directors do not call a meeting when so required, the members can call one themselves (Sec 305). If all else fails, the court can call a meeting (Sec 306). (b) in the case of any other meeting by a majority in number of the members having a right to attend and vote being a majority together holding not less than ninety-five per cent. in nominal value of the shares giving that right. (1) If the directors have appointed a chairman, the chairman shall chair general meetings if present and willing to do so. (3) The person chairing a meeting in accordance with this article is referred to as "the chairman of the meeting".